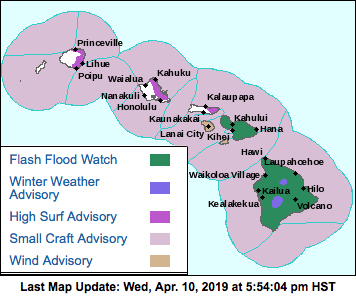 The National Weather Service in Honolulu has issued a Flash Flood Watch for Maui and Hawaii Island from midnight tonight (April 10) through Friday afternoon (April 12). An upper level low approaching the islands from the northeast will bring an unstable airmass to Maui and Hawaii Island. High pressure to the northeast will maintain a trade wind surface flow, focusing the heaviest of rain along windward areas. However the strong trade winds and the unstable airmass will allow for showers and thunderstorms to form over additional areas of Maui and Hawaii Island. The upper level low is expected to linger near these areas through the end of the week. The National Weather Service in Honolulu has issued a Winter Weather Advisory for Hawaii Island summits above 11,000 feet effective from midnight tonight (April 10) to 6 a.m. Saturday (April 13). A High Surf Advisory is in effect for east facing shores of Kauai, Oahu, Molokai, Maui and Hawaii Island from 6 a.m. Thursday (April 11) to 6 p.m. Saturday (April 13). Surf is forecast to be in the 5-8 foot range along east facing shores on Thursday rising to 7-10 feet Friday and Saturday. A Small Craft Advisry is in effect until 6 p.m. Saturday (April 13) for Kauai, Oahu, Maui and specifically Hawaii Island waters of the Alenuihaha Channel, windward, leeward and southeast waters. Offshore winds are forecast to be in the 20-30 knot range with seas 8-11 feet. A Wind Advisory remain in effect until 8 p.m. Thursday for Lanai, Kahoolawe, Maui and Kohala. Winds are forecast to be from the northeast at 20-35 mph with localized gusts to 50 mph across Lanai, Kahoolawe, the central valley and west end of Maui and the South Kohala district of the Hawaii Island. Winds will be strongest over and immediately downwind of mountains.